Worth, Benefit, Profit, or Value? Is It Worth it? 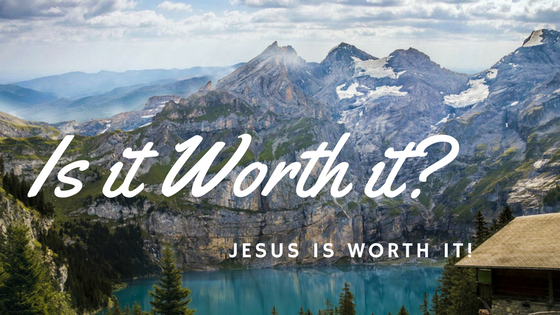 Jesus is Worth It! Is it worth it? This is a question we commonly ask when weighing the cost of a particular decision. The “it” we are referring to when we pose this question can refer to a number of different things, such as our time, our money, our strength, our safety or our comfort. We weigh the potential gain against the necessary risk to determine if we deem something to be “worth it”, and decide accordingly. I remember telling a family member about our plans to do YWAM in 2012. Their response sort of shocked me. After sharing with them all the details of what we’d be doing, they matter of factly said “well that’s a waste”. Often when we first tell people about our plans to move to the Middle East, they have a similar reaction; an unmoved heart that questions whether what we’re doing is really worth it. The disciples had the same reaction to a young woman when she poured her alabaster jar of costly perfume on to Jesus the week before he would be crucified. When a room full of disciples, the very men who would establish the early church, looked down upon a young woman for what they saw as foolish devotion, Jesus does not stay silent. He says “what she has done is a beautiful thing to Me”. And then the Son of God goes on to commemorate her act of extravagant devotion in saying that wherever the gospel is preached, so should the story of what Mary has done be told. So then, is it worth it for us to move to there? Is it worth it to leave the relative safety and comfort of Canada for the Middle East? What about spending years learning a new language and adapting to a foreign culture? Is it worth it? Is it worth it to be thousands of miles apart from loved ones? No, it isn’t. “It” is not worth it. Then what motivates us to go? It isn’t the need for workers, it’s not rules or commands, not our own compassion, nor is it statistics, or even a miraculous call. All of these reasons have validity and play a part in why we are going, but none of the reasons above will be able to sustain or fulfill us. We are going because our hearts are gripped by the realization that Jesus is worth it. We all have a choice to make when it comes to following Jesus. Like the rich young ruler in the book of Matthew, we can choose to hold on to our treasure or follow Jesus. That treasure will vary for each of us, but one thing is certain – if it is anything other than Jesus, we must lay it down to follow Him, for “where your treasure is, there your heart will be also.” (Matthew 6:21). We can choose to hold on to something inferior to Christ and walk away sad and dejected, or we can believe that He is worth more than anything we could gain in life, and more precious and valuable than anything we could lose in death. I want to be like the man who found a treasure in a field, then joyfully went and sold all that he had to buy the field. I want to be like Mary, who upon realizing the worth of Jesus liquidated her inheritance as she poured expensive perfume over his head. What has Jesus been calling you to give? Go ahead, give it away. You’ll find out that He truly is worthy of it all. Here is another great blog! ← Lost to Found! Death to Life! The Prodigal is Coming Home!